Your Excellencies. UN Secretary General, President of the General Assembly, Executive Director of UN Women and distinguished guests. 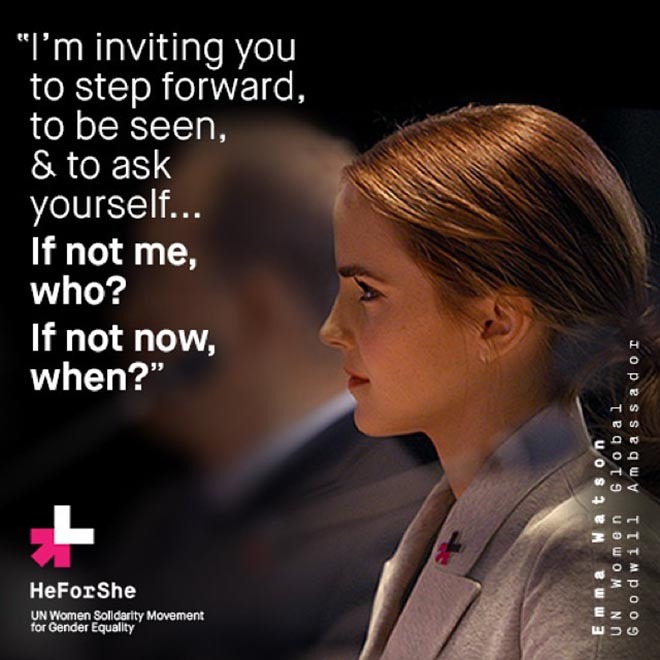 Today we are launching a campaign called ‘HeForShe’ I am reaching out to you because I need your help. We want to end gender inequality and to do this we need everyone involved. This is the first campaign of its kind at the UN. we want to try and galvanize as many men and boys as possible to be advocates for change. And we don’t just want to TALK about it but make sure it is tangible. I was appointed as a Goodwill ambassador for UN women 6 months ago, and the more I have spoken about feminism, the more I’ve realized that fighting for women's rights has too often become synonymous with man-hating. If there's one thing I know for certain, it is that this has to stop. For the record, feminism by definition is the belief that men and women should have equal rights and opportunities. It is the theory of the political, economic and social equality of the sexes. I started questioning gender based assumptions a long time ago. When I was 8, I was confused by being called "bossy". Because I wanted to direct plays that we would put on for our parents. But boys were not. When at 14, I started to be sexualized by certain elements of media. When at 15, my girlfriends started dropping out of loved sports teams, because they didn’t want to appear masculine. When at 18, my male friends were unable to express their feelings. I decided that I was a feminist. And this seemed uncomplicated to me. I think it is right that women be involved, on my behalf, in the policies and the decisions that affect my life. I think it is right that socially, I am afforded the same respect as men. But sadly, I can say that there is no one country in the world where all women can expect to receive these rights. 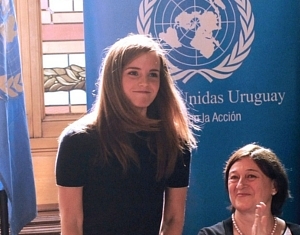 No country in the world can yet say that they have achieved gender equality. These rights I consider to be human rights but I am one of the lucky ones. My life is a sheer privilege because my parents didn't love me less because I was born a daughter. My school did not limit me because I was a girl. My mentors didn't assume that I would go less far because I might give birth to a child one day. These influencers are the gender equality ambassadors that made me who I am today. They may not know it but they are the inadvertent feminists who are changing the world today. We need more of those and if you still hate the word it is not the word that is important. It's the idea and the ambition behind it because not all women have received the same rights that I have the same rights that I have. In fact, statistically very few have been. In 1997, Hillary Clinton made a famous speech in Beijing about women's rights. Sadly, many of the things that she wanted to change are still true today. But what stood out for me the most was that less than 30 percent of the audience were male. How can we affect change in the world when only half of it is invited or feel welcome to participate in the conversation? Men I would like to take this opportunity to extend your formal invitation. Gender equality is your issue too. Because to date I've seen my father's role as a parent being valued less by society despite my needing his presence as a child as much as my mother's. I've seen young men suffering from mental illness unable to ask for help for fear it would make them less of a men or less of a man. In fact, in the U.K. suicide is the biggest killer of men between 20 to 49 eclipsing road accidents, cancer and coronary heart disease. I've seen men made fragile and insecure by a distorted sense of what constitutes male success. Men don't have the benefits of equality, either. We don't want to talk about men being imprisoned by gender stereotypes but I can see that they are. And when they are free things will change for women as a natural consequence. If men don't have to be aggressive in order to be accepted women won't be compelled to be submissive. If men don't need to control women won't have to be controlled. Both men and women should feel free to be sensitive. Both men and women should feel free to be strong. 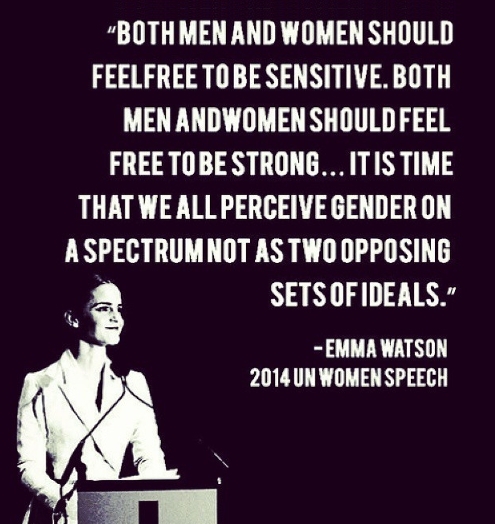 It is time that we all see gender as a spectrum instead of two sets of opposing ideals. If we stop defining each other by what we are not and start defining ourselves by who we are. We can all be freer and this is what HeForShe is about. It's about freedom. I want men to take up this mantle so their daughters, sisters and mothers can be free from prejudice but also so their sons have permission to be vulnerable and human, too. Reclaim those parts of themselves they abandoned and in doing so be a more true and complete version of themselves. You might be thinking Who is this Harry Potter girl? And what is she doing speaking at the U.N.? And it's a really good question. I've been asking myself at the same thing. All I know is that I care about this problem and I want to make it better. And having seen what I've seen and given the chance. I feel it is my responsibility to say something. Statesman Edmund Burke said all that is needed for the forces of evil to triumph is for good men and women to do nothing. In my nervousness for this speech and my moments of doubt I've told myself firmly. If not me, who? If not now, when? If you have similar doubts when opportunities are presented to you I hope that those words will be helpful, because the reality is, if we do nothing it will take 75 years or for me, to be nearly 100 before women can expect to be paid the same as men for the same work. 15.5 million girls will be married in the next 16 years as children and at current rates it won't be until 2086 before all rural African girls can have a secondary education.